Vancouver Olympics official: "It will be the longest domestic relay in Olympic history"
(CNN) -- The torch for the 2010 Vancouver Olympics was lit in a ceremony at the ancient Greek site of Olympia on Thursday, less than four months ahead of the games' opening ceremony. 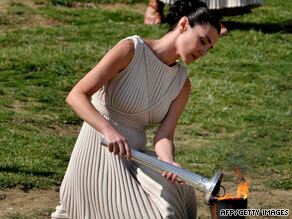 Actress Maria Nafpliotou, as a high priestess, lights the flame for the Vancouver 2010 Olympics on Thursday. The torch will be carried on an eight-day trip through Greece, the birthplace of the Olympics, before being transported to Canada for what will be the longest domestic torch relay in the games' history, officials said. Women dressed in white togas performed a ceremony on the green hillside at Olympia, the home of the Olympic flame and the place where the ancient Olympics took place. A woman playing the role of a high priestess lit the flame by sunlight focused on a mirror, the only way by tradition it can be lit. That fire then was used to light the Vancouver Olympic Torch, which Greek skier and three-time Olympian Vassilis Dimitriadis then carried on the first leg of its journey through Greece. "The Olympic torch and flame are the symbols of the values and ideals which lie at the heart of the Olympic Games," International Olympic Committee President Jacques Rogge said before the ceremony. The torch will carry a message of peace throughout the world, he said -- words echoed by Vancouver 2010 Chief Executive John Furlong. "Today we build a bridge between ancient Olympia and young Canada," he said. "Canada is a country with a welcoming spirit and a glowing heart. ... We will do all we can to be a shining example of the ideas and values that were first kindled here in this hallowed place." After its 1,351-mile (2,180-kilometer) trip through Greece, the torch will be taken to Canada. On October 30, the first of 12,000 torchbearers will begin carrying it through Canada on what will be a 106-day, 27,900-mile (45,000-kilometer) relay. "It will be the longest domestic relay in Olympic history, just to be sure every Canadian will be given the right to dream and celebrate," Furlong said. The torch relay is derived from ancient rituals in Olympia, where torch and relay races were popular festival events and where heralds traveled throughout Greece to announce the games. The torch for the 2010 Winter Games was designed by transportation and aerospace company Bombardier, a Vancouver Olympic sponsor. The lean curves of the white torch were inspired by the lines carved in the snow by winter sports and by the "undulating beauty of the Canadian landscape," the company said. The torch's special construction will allow it to burn through a range of winter weather, including snow, rain, sleet, wind and subzero temperatures, Bombardier said. It weighs 3.5 pounds (1.6 kilograms) fully fueled, the company said. The flame is due to arrive in Vancouver, British Columbia, on February 12 when the opening ceremony of the 2010 Winter Games will be held at the domed BC Place Stadium.